The following article will explain how to prepare a bootable microSD card with Tizen:Common for the open source hardware developer board Radxa Rock. This is a single board computer with Rockchip RK3188 SoC that features a quad core ARM Cortex-A9 @ 1.6 Ghz and Mali400-mp4 GPU. It should be possible to apply the same tutorial with some minor modifications for other devices with RK3188. Tizen-rockchip is an open source project which offers configuration files and tutorials for porting Tizen:Common and other Tizen profiles to devices with Rockchip SoC. 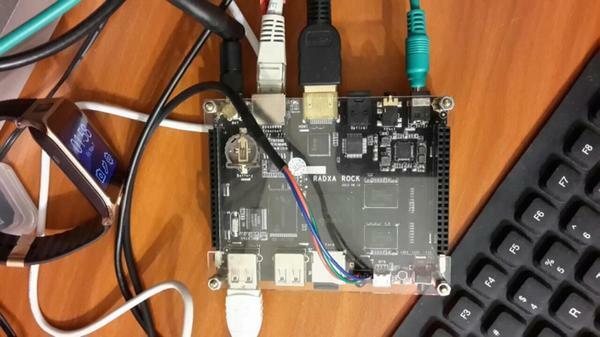 The first supported device is Radxa Rock. Login as root using password tizen. Perform the following actions if you want to create your own Tizen:Common image for Rockchip RK3188 devices from scratch. Pay attention that the instructions are for advanced users only! Clone the Linux kernel and its modules for Rockchip. Build Tizen:Common image for ARMv7 from scratch or download the image available for Sunxi devices. Prepare bootable micro SD card for Radxa Rock. You can do it using fdisk. Alternatively you can download the ubuntu image provided by Ian Morrison and after that to replace the rootfs with Tizen:Common. Make sure that weston is using frame buffer as explained at this article. Copy the bootloader and the kernel to partition /dev/sdX of the micro SD card following these instuctions. Copy the Tizen:Common to the partition /dev/sdX1 of the micro SD card using dd. Pay attention that the micro SD card should be unmounted before running dd. It is highly recommended to execute sync after dd. Mount the micro SD card and remove the line about boot from /etc/fstab. Plug the microSD card into Radxa Rock and turn on the device. For more information regarding the display options and supported resolutions please have a look at Radxa Rock display guide.